WASHINGTON — President Donald Trump announced the reduction of two national monuments in Utah on Monday, lambasting past administrations for overreach in a decision likely to touch off a battle with conservation groups and Native American tribes. Bears Ears, designated by President Barack Obama, was significantly downsized, from about 1.3 million acres to about 220,000 acres of federally protected land. And Grand Staircase-Escalante, designated by the Clinton administration, will go from 1.9 million acres to a little over 1 million acres. 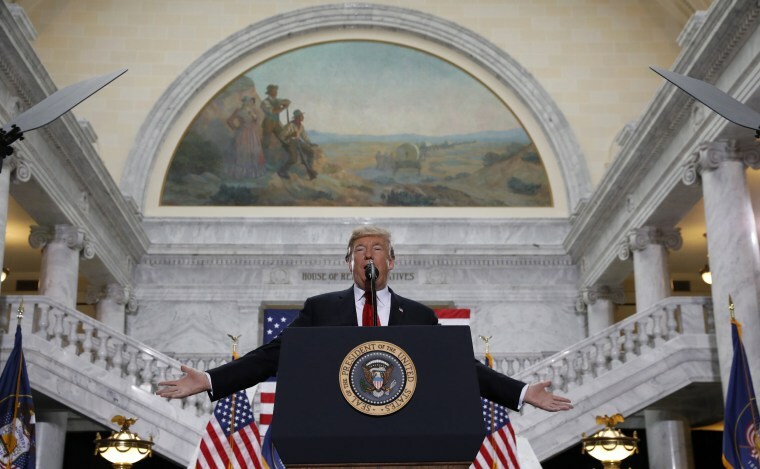 Trump excoriated anyone who believes "that the natural resources of Utah should be controlled by a small handful of very distant bureaucrats located in Washington." "Guess what? They're wrong," he told a crowd at the Utah State Capitol in Salt Lake City. Interior Secretary Ryan Zinke recommended the changes, which Trump made official Monday with two presidential proclamations. "Your timeless bond with the outdoors should not be replaced with the whims of regulators thousands and thousands of miles away. They don't know your land and, truly, they don't care for your land like you do," Trump said. Trump said the two locales — Bears Ears and Grand Staircase — exemplify "abuses" of past administrations that used the Antiquities Act of 1906 to over-designate thousands of acres as federally protected land. "No one loves public land more than I do," Zinke told reporters on Air Force One headed to Utah. "But I am a steadfast believer that public lands are for public use. And when a monument is used to prevent, rather than protect, the president was right to take action." Trump enlisted Zinke, Utah Sens. Orrin Hatch and Mike Lee and other local officials for advice on how to handle the Bears Ears national monument decision. They assured him, Trump said Monday, that the major reduction would be "incredible" both for the state and the country. "Will it be at all controversial? They all told me no," Trump joked, alluding to the potential legal challenges swirling around the decision. Jacqueline Pata, executive director of the National Congress of American Indians, previously told NBC News that the tribes affected by the Bears Ears decision are “waiting but prepared” to take action. Conservationists have also expressed concern about how the newly unprotected land will be used, and on Monday, 10 groups sued the administration in federal court in Washington D.C. In the suit, they claimed that the reduction of Grand Staircase would leave "remarkable fossil, cultural, scenic, and geologic treasures exposed to immediate and ongoing harm." Among those harms, court papers say, are large sections of the monument where "troves" of unique dinosaur fossils have been discovered. Those areas "will now be open to harmful developments such as coal mining, new roads, off-highway vehicle abuse, and oil and gas drilling," the documents say. "These types of developments will scar the lands, compromise vital parts of the paleontological record, ruin their wild, natural character, and destroy the resources the Monument was created to protect." And Jonathan Nez, vice president of the Navajo Nation, said on MSNBC that the president has overstepped his authority in reducing Bears Ears, noting that the announcement comes not long after Trump revived his "Pocahontas" nickname for Sen. Elizabeth Warren, D-Mass., who has claimed Native American heritage. "It’s a sad day in Indian country, and it’s sad day for Americans," Nez said. "The Navajo Nation is going to take action and we are going to say, 'No,' to this overstepping [of ] boundaries," Nez added. Even Patagonia, the outdoor clothing company, condemned the administration's move with an unusually sharp message on its homepage: "The President stole your land," the company said in white text on a black background. "In an illegal move, the president just reduced the size of Bears Ears and Grand Staircase-Escalante National Monuments. This is the largest elimination of protected land in American history." Meanwhile, supporters said the downsizing frees up the land for multiple uses — not just mining, but also ranching, logging and riding off-road vehicles. And Trump called the Bears Ears move "so sensible." Zinke was also undeterred by possible legal challenges — and steadfast in his explanation that this "is not about energy," but rather about expanding how people can use this land. "I don’t yield to pressure, only higher principle," he said en route to Salt Lake City. "And I don’t think public policy should be based on the threat of lawsuit. I feel very confident." Over the summer, Zinke recommended some changes to a "handful" of national monuments, but no eliminations after a four month-long review triggered by the president. Trump ordered the review in April after complaining about improper "land grabs" by former presidents, including Obama. But while Trump was in Utah for the monument announcement, he also waded into the state's political drama surrounding Hatch's potential re-election bid. Trump repeatedly praised the work of the 83-year-old senator, saying he hoped Hatch "will continue to serve your state and your country in the Senate for a very long time to come." That support is widely viewed as a slap at former presidential hopeful Mitt Romney, who has been rumored to be exploring a run for Hatch's seat. Asked by reporters if the pro-Hatch comments should be seen as a message to Romney, Trump dodged, calling Romney "a good man." Geoff Bennett and Tim Stelloh contributed.